Remember: Your biggest asset isn’t your home or your car; it’s your ability to generate an income. We'll venture a guess… You would never dream of driving without insurance, right? And your home and its contents are covered? Each day at Kearney Financial Planning, we encounter people who insure their homes and cars but fail to realise their biggest asset is actually their ability to generate an income. 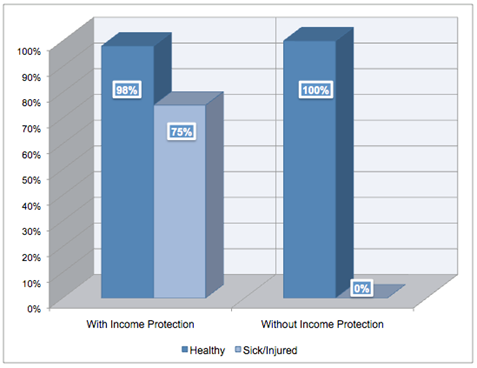 Income Protection provides coverage specifically for individuals who would otherwise lose all earnings due to sustained injury or illness. This financial benefit ensures that your standard of living will not be affected by your inability to work. At Kearney Financial Planning, our advisers will illustrate how loss of income would affect you, your family’s security and your overall financial stability. As always, your individual situation and personal goals will be addressed by our recommendations, and our strategy-focused advisers will help you to tax-effectively and inexpensively protect yourself and your family. The Kearney Group worked out what types and level of insurance we would require so that if something were to happen to either of us, we would not suffer financial stress at a time that would already be stressful enough. Kearney Financial Planning Pty Ltd (ACN 159 163 774) is a Corporate Authorised Representative of Imagineering FS Pty Ltd (ABN 41 627 350 636), which is the holder of Australian Financial Services Licence (AFSL) 510873. Kearney Finance Pty Ltd (ACN 609 631 816) is a Corporate Credit Representative of Australian Finance Group Ltd (AFG) (ABN 11 066 385 82), 100 Havelock Street, West Perth WA 6005 which is the holder of Australian Credit Licence (ACL) 389087. PJ Kearney & Co Pty Ltd trading as Kearney & Co (ABN 80 007 077 947), Kearney Financial Planning Pty Ltd, Kearney Finance Pty Ltd, Kearney Group Pty Ltd (ACN 140 859 481) and Imagineering FS Pty Ltd are collectively referred to on this website as “Kearney Group Financial Services” or “Kearney Group”. Kearney Group operates from Suite 8, 651 Victoria Street, Abbotsford VIC 3067. Although one adviser in Kearney Group may offer you different services, each entity is solely and separately responsible for the services provided by its representatives. Specifically, Imagineering FS Pty Ltd authorises and is responsible for the financial planning advice provided by Kearney Financial Planning Pty Ltd only, and Imagineering FS Pty Ltd is in no way responsible or liable for the accuracy or quality of the information provided by representatives of the other Kearney Group entities. Where this website includes investment results and performance data, it is important to understand that past performance is not a reliable indicator of future performance.